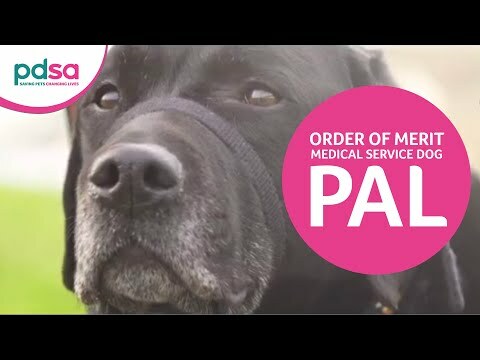 The PDSA Order of Merit was introduced in 2014. The first dog to receive the award was Linpol Luke (Obi), on behalf of all the police dogs that served during the 2011 London Riots. Claire was rendered unable to tell when she was hypoglycaemic, which meant that her children would often return home from primary school, finding her collapsed. Her health diagnosis plunged her into a severe bout of depression and she was later diagnosed with Post-Traumatic Stress Disorder – a side effect of being told she had a life-limiting condition. She was left with no confidence and unable to leave the house on her own. The cycle of depression and hypo-induced comas continued for six years. Her two small boys became young carers and the family’s plight became increasingly desperate. In the depths of despair, Claire saw an advert for Medical Detection Dogs and applied for assistance. In 2012, Claire was introduced to 16-month-old Labrador, Pal and their remarkable relationship began. On the very first night in his new home, Pal alerted Claire to a hypo as she slept – nudging her face and ribs with his nose and licking her. Pal does this by smelling the chemical changes in Claire’s breath. His ability to do this has stopped Claire from falling into hypo-induced comas on countless occasions – meaning that her boys no longer find her dangerously ill when they return home from school. Pal will fetch Claire’s blood sugar monitor, glucose, insulin and will even bring her the phone if needed. If Claire is too ill to help herself, Pal will fetch someone or push the panic button fitted in the family home, which alerts the emergency services. Pal accompanied Claire to all her dialysis sessions, helping to keep her calm and happy as she undergoes treatment. In six years, Pal has alerted Claire to over 12,000 separate blood-sugar changes: changes that, if not caught in time, could have killed her. Pal’s interventions have prevented NHS emergency call-outs and resulted in fewer hospital admissions for Claire. On 22 May 2017, Police Dog Mojo and his handler PC Phil Healy had returned home after an early shift. Later that evening, news came through of an explosion at the Arianna Grande concert inside Manchester Arena. Phil and Mojo immediately made their way back to work. They were the first dog team on the scene and it was very chaotic. Their first task was to search Victoria train station's concourse, which was being used as the main casualty treatment area for the incident. Mojo searched around the injured victims to make sure that the area was safe and clear of further explosives, for the responding emergency services and the public. PC Healy and Mojo were then moved into the Arena itself and to the site of the explosion. Mojo worked in horrendous conditions, searching for secondary devices among the sea of unattended, abandoned items, to secure the area and ensure the safety of the Firearms Units and other attending emergency services working in the area. PC Healy and Mojo were later joined by other dog teams and together, they searched the whole stadium. Mojo worked alongside his handler until 7am the following morning. On their way home, Mojo and PC Healy were called out again to follow up on reports of a suspicious item elsewhere. Echo served with Greater Manchester Fire and Rescue Service as a Search and Rescue dog from 2004 to 2013. 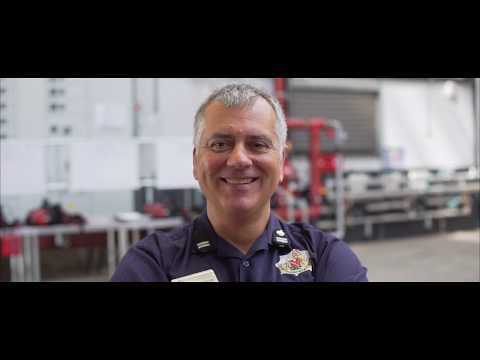 During his tenure, he was deployed as part of the UK Fire Service Overseas Response Team, to assist in the aftermath of an earthquake in Haiti, which completely devastated large parts of the country in January 2010. The capital, Port-au-Prince, was buried under tonnes of collapsed buildings and structures. In the heat and humidity and accompanied by a UN Police convoy, Echo’s skills were deployed to help speed up the search process. He conducted 46 separate searches over a two week period. Sadly, due to the magnitude of the quake, everyone that Echo found had already died. Despite the intensely challenging conditions, Echo worked tirelessly and without hesitation for almost two weeks before he and Mike returned home to the UK. Cracker was a Fire Service Investigation Dog with Greater Manchester Fire and Rescue Service between January 2007 and February 2017. She was trained to detect 20 different types of accelerants, using her powerful sense of smell. On 12 March 2013 a major explosion occurred at a large two-storey detached building on War Office Road, Rochdale. A strong smell of petrol was detected and Cracker was deployed to investigate. After an unproductive ground search, Cracker was instructed to climb what remained of the staircase, to search the upper floor. This meant negotiating a large hole in the floor, as well as making her way through fallen wooden beams and roofing materials. Cracker tracked along the skirting board to a place outside where the bathroom had once been and gave a positive indication. As a result of her efforts, the Fire Investigation Team was able to determine that the explosion was a result of an arson attack. On 5 March 2014 Cracker attended a ‘halfway house’ property in Ashton, Greater Manchester, where a man had been murdered and his body set on fire. Cracker, dressed in a forensic dog suit to preserve any evidence, undertook a search of the property and, as a result of her efforts, the culprit received a 30-year jail sentence. As well as attending crime scenes, Cracker also visited schools to help educate young people in fire and home safety. Border Collie Bryn has worked as a search and rescue dog alongside his handler Steve Buckley since he was a puppy. In 2005 Bryn became fully qualified and UKISAR graded. In 2009, they became one of only four UK dog teams to attain the International Rescue Dog Organisation’s ‘mission readiness test’. The test consisted of seven searches over 36 hours, a 10km march, dog first aid and working at height. Alongside his work with Cheshire Fire and Rescue Service Bryn has been deployed to building collapses, missing persons’ searches and gas explosions throughout the UK. His international work involved working in Japan (2011) after the earthquake and tsunami, and in Nepal (2015) following the devastating earthquake which killed and injured thousands. Bryn’s ability to search large areas for casualties, with greater speed and efficiency than his human counterparts, was invaluable. It minimised the need for risky interventions when faced with precarious and volatile rescue situations. As well as helping find casualties within disaster areas, Bryn’s skills have also helped reunite families with lost loved ones, allowing them to be laid to rest. He retired in May 2016 after an outstanding 11-year career. During his service, PD Sweep completed around 100 successful searches, removing dangerous weapons, drugs and poisons from the streets of Scotland. He successfully located £512,000 worth of street drugs, £250,000 of cash, six shotguns, three handguns, a flare gun, two rifles, 3,500 shotgun cartridges and 1,000 rounds of ammunition. Thirteen-year-old Labrador Sabby was awarded the PDSA Order of Merit in recognition of her role supporting people with learning difficulties. Her warm and gentle nature helped her develop a special relationship with patients, allowing them to develop skills, make decisions and learn responsibilities. Opportunities that, without Sabby’s involvement, would have been unavailable to them. Sabby has also worked alongside clinical psychologists, supporting patients who suffer from extreme dog phobias. Her involvement has been recognised as a key factor in enabling these patients to become further integrated into their community. 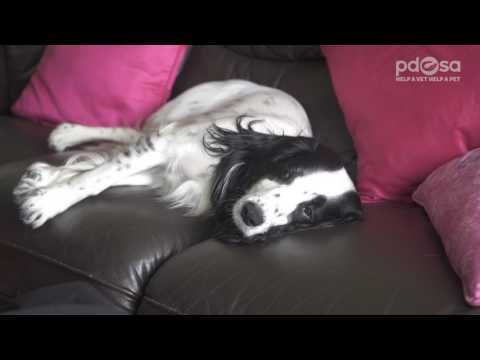 Molly’s owner Lucy suffers with Ehlers-Danlos Syndrome which, coupled with other health complications, can leave her feeling withdrawn, isolated and unhappy. Lucy’s condition is classed as life-limiting. Prior to Molly’s arrival in her life, she had been struggling to cope with the chronic pain and was bed-bound due to complications. Molly joined the Watts household as an eight-week-old puppy and immediately lifted Lucy’s spirits. Their bond was so strong that when Molly was 10-months-old she began working with Dog Assistance In Disability (Dog A.I.D), who help people with disabilities to train their pet dogs to become Assistance Dogs. Molly’s skills are now a lifeline to Lucy on a daily basis, she supports with everyday tasks that would otherwise be impossible. Molly also protects Lucy, warning her when her temperature spikes or her blood pressure drops. Whizz, a Newfoundland dog, saved nine people and another dog from drowning during a ten-year water rescue career. Whizz patrolled the Bristol Channel and the River Severn with the Royal Navy Rescue and the Severn Area Rescue Association. As well as his work as a water rescuer, Whizz also enriched the lives of hundreds of people as a fundraiser and therapy dog, alongside his owner David Pugh. Standing at over six feet tall and weighing in at 12 stone, Whizz was a gentle giant. He was trained to rescue people in peril from the water by owner David when he was just a year old. 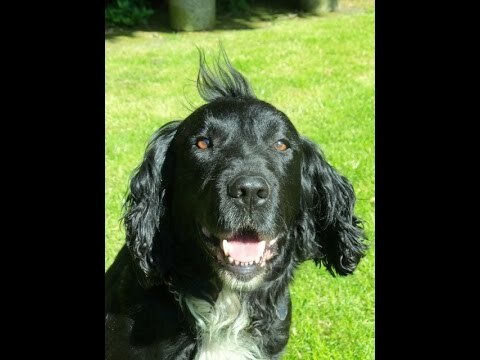 Springer Spaniel Jake has been recognised for his outstanding service to Warwickshire Police over a ten-year career. Jake made over 500 operational finds including assault rifles, shotguns, hand guns, over £650,000 worth of banknotes and over £4.5 million worth of illegal drugs. 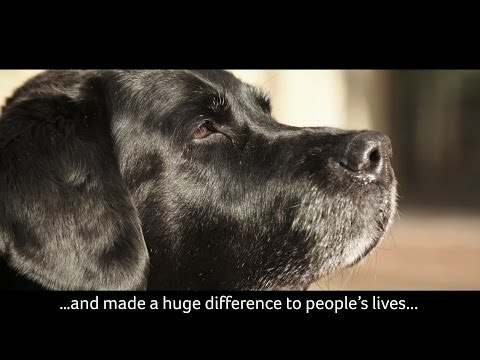 Jake’s career with Warwickshire Police began at 18-months-old, when he underwent a four-week intensive course to train him to search and identify drugs. Jake went on to complete similar courses to find firearms, ammunition and banknotes. After graduation, he was partnered with PC Andy Crouch and the pair stayed together throughout Jake’s illustrious career. Jake worked at some high-profile sporting events, such as the Cheltenham Gold Cup Festival and major music events, including Glastonbury. He even uncovered a stash of drugs live on TV. At one music festival Jake found over £2,000 worth of well-concealed cannabis on a tour bus, resulting in the delay of the headline act. On another occasion he intercepted a car heading into a festival, leaping through an open window to uncover £1,000 worth of cocaine, hidden underneath the centre console. Jake retired in August 2014. He passed away suddenly in March 2015. His PDSA Order of Merit Medal was presented to Gwen, serving Police Dog with Warwickshire Police, at Goldsmiths’ Hall, London on 29 April 2015. During the 2011 London riots, 160 Metropolitan Police dogs were called into action on various occasions during the disturbances. During one incident, 11 Dogs and their handlers were initially deployed to Tottenham Police Station to support officers who were under sustained and violent attack from around 300 protesters. They successfully pushed the protesters back, helping to secure the area before being redeployed to other locations. Over the next few hours, the dogs were repeatedly redeployed to assist Police Support Units across the city. Officially named 'Linpol Luke' but known affectionately as Obi to his friends, the English Shepherd is described by his handler Sgt Phillip Wells as a valued colleague and partner. Like Obi, many of the dogs deployed suffered injuries during the confrontations and in recognition of the hard work of all 160 police dogs that served, Obi was awarded the PDSA Order of Merit on their behalf.